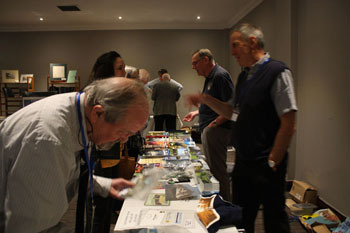 Report on the 2018 Association Annual Gathering in Southampton, where members socialised, watched films, and visited stalls. Antje Steinfurth gave a talk on Project Pinnamin. 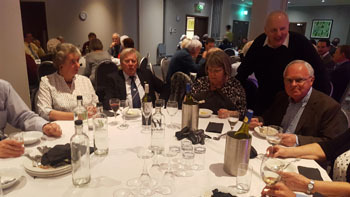 The 2018 Tristan da Cunha Association Annual Gathering made a welcome return to the Southampton Holiday Inn on Saturday 7th April, as always the Saturday after Easter. 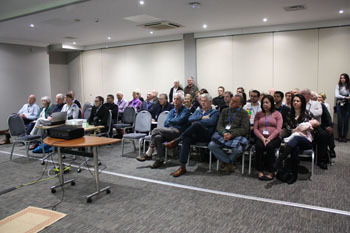 The event was again well-attended, with about 100 at the day event and/or the evening dinner dance. The majority stayed in the hotel and enjoyed dinner together there, or at nearby restaurants on Friday evening. 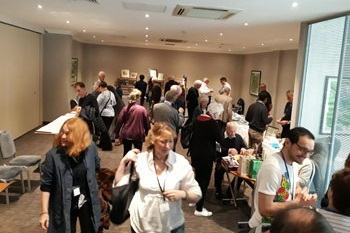 Saturday events began with a Tristan film show during the morning and stalls (Miles Apart Book Stall, Tristan artefacts stall, auction display, Tristan Association products stall and the raffle) were busy throughout the day. The morning Tristan film show was well attended. Lunch - at time for food and catching up with old friends. 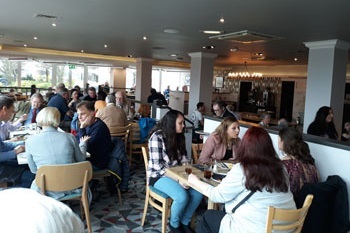 We enjoyed a two course buffet lunch in the hotel restaurant as old and new friends caught up with one another. We were delighted to welcome our honoured Tristan islander guests, Rhyanna Swain, Jade Repetto and Janice Green, who are studying at the nearby Peter Symonds College in Winchester They are recipients of grants from the Tristan Education Trust Fund, which is run by the Tristan Association. As well as the three young ladies, there was also a good turnout of Tristan islanders and their families who are now resident in the UK. 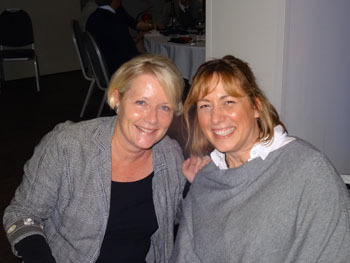 These included Debbie Elsmore (née Repetto) and her daughter Megan, Pat and Sue Patterson (née Green), Linda Lavarello, Barry and Hazel Carter (née Swain), Joan King (née Rogers), Linda Evans, Frank Rogers and Sarah Ludwig (née Swain) from Germany who was attending the event for the first time. Therefore this year had a special feel with so many islanders renewing friendships with family and friends. As usual we had a number of members from abroad. 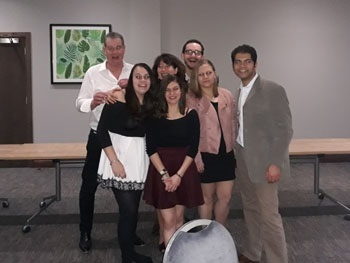 As well as Sarah from Germany, we welcomed Albert Beintema from the Netherlands, Angelo Repetto from Italy, Daniel and Colette Halter from Switzerland and Marc Escudier from France. 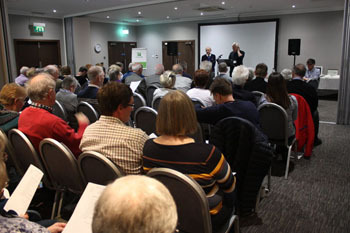 The afternoon started with a brisk and businesslike Annual General Meeting which saw no change in officers or committee members and a stable membership and financial situation. Chairman Michael Swales then introduced our guest speaker, Antje Steinfurth. Members will have read Antje's reports on her Northern Rockhopper Penguin research and wonderful photos of them on her beloved Nightingale Island in recent Newsletters. 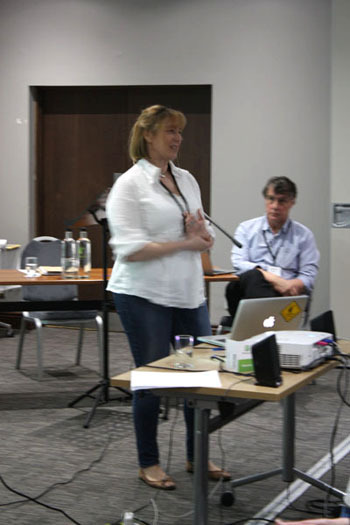 Her well-illustrated talk kept the audience enthralled and Antje gave us further insight into the sophisticated research programme that was Project Pinnamin, under her capable leadership. 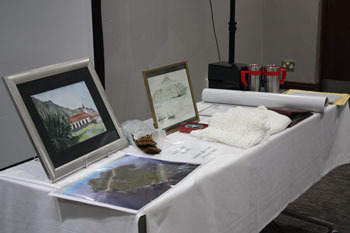 Following afternoon tea (day guests also had the benefit of hot and cold refreshments throughout the day) the raffle was drawn. 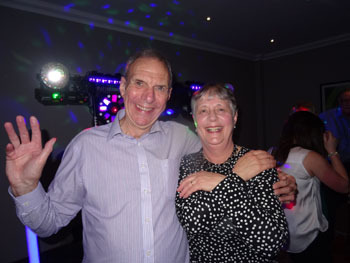 Once again there was a good selection of generously donated prizes and the committee wish to thank those who gave prizes and time to run the raffle so efficiently. 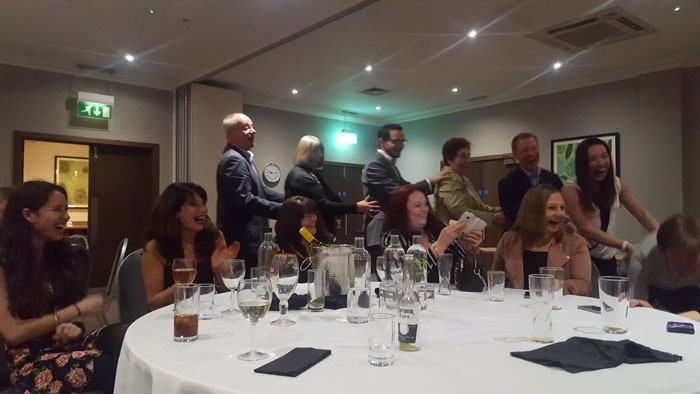 There followed the annual auction in aid of the Tristan Education Trust Fund which will raise about £600 once Gift Aid is claimed. 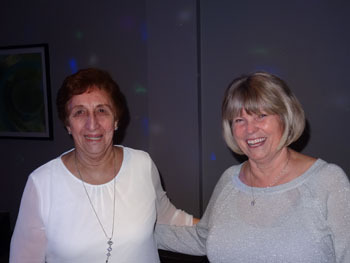 Honoured guests Jade Repetto, Janice Green & Ryhanna Swain, at the daytime events (left), and the dinner dance (right). 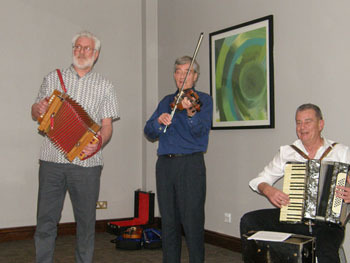 The Dinner Dance was the best-attended since the inaugural event at the 2006 Annual Gathering in Bournemouth. 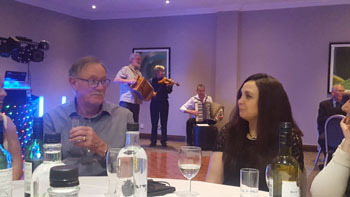 After the two course dinner, the now regular traditional Tristan dances were accompanied by the trio of Peter Millington, Mike Faulds & Ian Lawrence, starting with the well-known Pillow Dance and continuing with the Donkey Dance (both shown in photos below), and a Shottee. 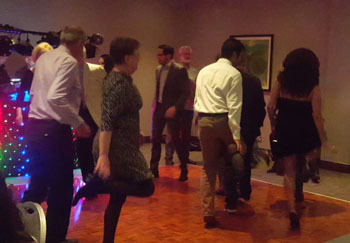 The dance floor stayed busy as the disco played. 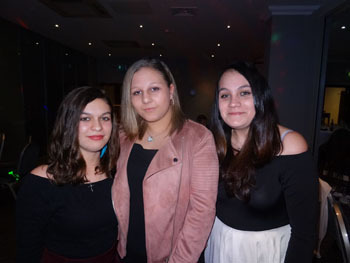 It was so good that Jade, Janice and Rhyanna were able to be at the heart of the party. Having a go at the Donkey Dance (with mixed levels of success). Half the fun was getting it wrong. Hilarity or relief? The Pillow Dance passes by to another victim. Are the Pillow Dancers coming our way? Jim Kerr and Hazel Carter look apprehensive! 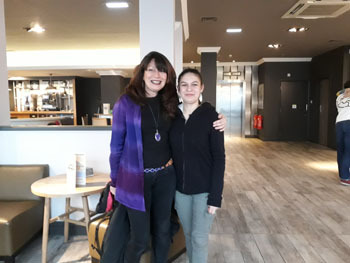 Jade with her UK guardian Debbie Elsmore, still smiling as they wait to go home. 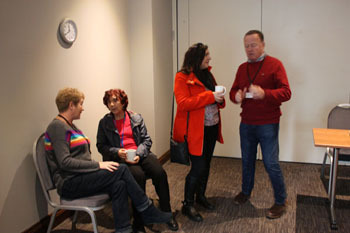 As everybody gathered again for breakfast and goodbyes, many were making promises to be at the 2019 Annual Gathering which will again be at the Southampton Holiday Inn on the Saturday after Easter, which in 2019 will be on Saturday 27th April.